TH E M R EP O RT | 17 SPONSORED CONTENT to do well. For example, since blockchain is conceptually a type of database, people often think they can solve database problems with it. The litmus test for this is to ask yourself whether you could solve the problem with Oracle. If you can, then just do that—it will likely be easier and cheaper. If not and you are looking to create per- sistent, redundant, shareable data, blockchain technology might be worth exploring. 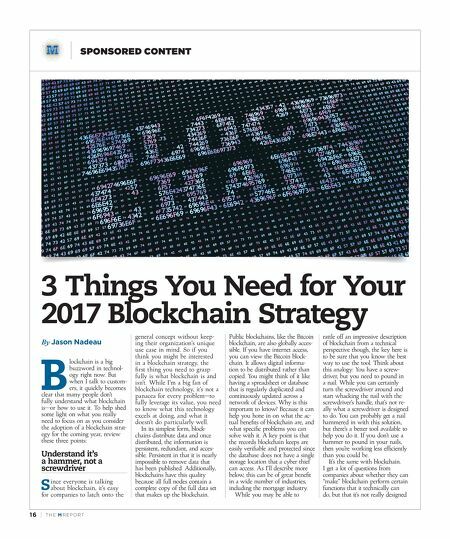 So as you con- sider implementing a blockchain strategy, your first goal is to use it for the right things. Look around your organization for screws that need tightening, not nails that need hammering. In other words, understand what blockchains are fundamentally best at doing. In the mortgage industry, that is the ability to provide the same level of preservation of information, document integrity, and tamper seals around documents without requiring e-signatures. 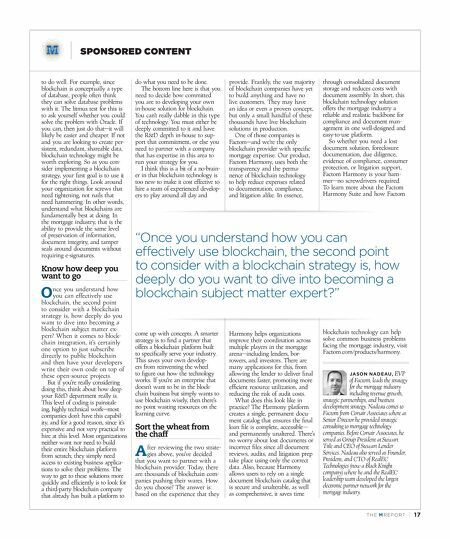 Know how deep you want to go O nce you understand how you can effectively use blockchain, the second point to consider with a blockchain strategy is, how deeply do you want to dive into becoming a blockchain subject matter ex- pert? When it comes to block- chain integration, it's certainly one option to just subscribe directly to public blockchain and then have your developers write their own code on top of these open-source projects. But if you're really considering doing this, think about how deep your R&D department really is. This level of coding is painstak- ing, highly technical work—most companies don't have this capabil- ity, and for a good reason, since it's expensive and not very practical to hire at this level. Most organizations neither want nor need to build their entire blockchain platform from scratch; they simply need access to existing business applica- tions to solve their problems. The way to get to these solutions more quickly and efficiently is to look for a third-party blockchain company that already has built a platform to do what you need to be done. The bottom line here is that you need to decide how committed you are to developing your own in-house solution for blockchain. You can't really dabble in this type of technology. You must either be deeply committed to it and have the R&D depth in-house to sup- port that commitment, or else you need to partner with a company that has expertise in this area to run your strategy for you. I think this is a bit of a no-brain- er in that blockchain technology is too new to make it cost effective to hire a team of experienced develop- ers to play around all day and come up with concepts. A smarter strategy is to find a partner that offers a blockchain platform built to specifically serve your industry. This saves your own develop- ers from reinventing the wheel to figure out how the technology works. If you're an enterprise that doesn't want to be in the block- chain business but simply wants to use blockchain wisely, then there's no point wasting resources on the learning curve. Sort the wheat from the chaff A fter reviewing the two strate- gies above, you've decided that you want to partner with a blockchain provider. Today, there are thousands of blockchain com- panies pushing their wares. How do you choose? The answer is: based on the experience that they provide. Frankly, the vast majority of blockchain companies have yet to build anything and have no live customers. They may have an idea or even a proven concept, but only a small handful of these thousands have live blockchain solutions in production. One of those companies is Factom—and we're the only blockchain provider with specific mortgage expertise. Our product, Factom Harmony, uses both the transparency and the perma - nence of blockchain technology to help reduce expenses related to documentation, compliance, and litigation alike. In essence, Harmony helps organizations improve their coordination across multiple players in the mortgage arena—including lenders, bor- rowers, and investors. There are many applications for this, from allowing the lender to deliver final documents faster, promoting more efficient resource utilization, and reducing the risk of audit costs. What does this look like in practice? The Harmony platform creates a single, permanent docu - ment catalog that ensures the final loan file is complete, accessible— and permanently unaltered. There's no worry about lost documents or incorrect files since all document reviews, audits, and litigation prep take place using only the correct data. Also, because Harmony allows users to rely on a single document blockchain catalog that is secure and unalterable, as well as comprehensive, it saves time through consolidated document storage and reduces costs with document assembly. In short, this blockchain technology solution offers the mortgage industry a reliable and realistic backbone for compliance and document man - agement in one well-designed and easy-to-use platform. So whether you need a lost document solution, foreclosure documentation, due diligence, evidence of compliance, consumer protection, or litigation support, Factom Harmony is your ham - mer—no screwdrivers required. To learn more about the Factom Harmony Suite and how Factom blockchain technology can help solve common business problems facing the mortgage industry, visit Factom.com/products/harmony. JASON NADEAU, EVP of Factom, leads the strategy for the mortgage industry including revenue growth, strategic partnerships, and business development strategy. Nadeau comes to Factom from Corsair Associates where as Senior Director he provided strategic consulting to mortgage technology companies. Before Corsair Associates, he served as Group President at Stewart Title and CEO of Stewart Lender Services. Nadeau also served as Founder, President, and CTO of RealEC Technologies (now a Black Knight company) where he and the RealEC leadership team developed the largest electronic partner network for the mortgage industry. "Once you understand how you can effectively use blockchain, the second point to consider with a blockchain strategy is, how deeply do you want to dive into becoming a blockchain subject matter expert?"